Thank you for considering Realtime-Spy! We guarantee you will not be let down by its powerful capabilities. 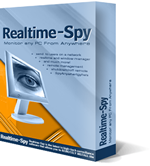 You may purchase Realtime-Spy online via secure ordering, via phone/fax, or via postal mail. All purchases come with unlimited, lifetime tech-support (including free remote assistance), as well as free minor version upgrades, and full upgrades for 60 days! Extra seats can be purchased and added to the base purchase price to cover more computers if you have them! All prices are one-time non-recurring purchases. Purchase our cutting-edge remotely installable cloud-based computer monitoring software and start monitoring your Mac today! We are committed to providing you with the best computer monitoring software solutions possible. If you have any problems that we are unable to resolve please contact us and we will give you your money back. Your purchase entitles you to free minor upgrades for as long as you use the software. The latest version of Realtime-Spy is always available in your member's area. You receive free 24/7 support for as long as you use Realtime-Spy. Our support also includes free real-time remote assistance to help setup the software if you need it. Spytech has been producing award-winning computer monitoring solutions for over 18 years, providing you with refined, easy-to-use solutions that will fulfill your monitoring needs. Disclaimer: Realtime-Spy is a professional computer monitoring solution designed for parents and employers to legitimately monitor their computer use. If you intend on monitoring a computer you do not own and do not have authorization/permission to monitor, you should not purchase Realtime-Spy. This is potentially illegal, and not condoned by Spytech. Spytech cannot be held liable for anyone abusing Realtime-Spy and using it to monitor a computer they do not own, or have authority/permission to monitor. Copyright © Spytech Software and Design, Inc. All Rights Reserved.